This very simple recipe will tide you over the entire summer season. Place the minced beef into a large mixing bowl. Add in the sliced spring onions together with the breadcrumbs, grated cheese and the egg and mix well. Season the mixture lightly with the Worcestershire sauce (if using), salt & pepper and ground cinnamon. Mix well to ensure the flavouring is well distributed throughout. Divide the mixture in 8 and mould each piece into a burger shape (you can freeze any excess burgers). 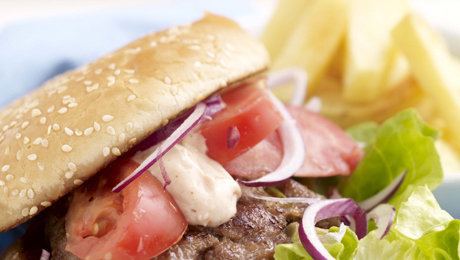 Refrigerate for at least 30 minutes; this will help to prevent the burgers from falling apart. After they have rested sufficiently, heat a large frying pan with a little oil, pan fry the burgers on each side until they are golden brown and then transfer the burgers to a baking tray and continue cooking in the oven for another 10-12 minutes to ensure the burgers are completely cooked through. Lightly toast the burger buns and then spread with a little mayonnaise and arrange the burger on top. Garnish accordingly with some torn lettuce, sliced red onion and tomato. Made these and they are delish! I find any super valu recipe I have tried to be fail proof &amp; have passed some onto my friends.